Hadean Press is thrilled to announce the release of a new title from Frater Acher, Speculum Terræ: A Magical Earth-Mirror from the 17th Century. 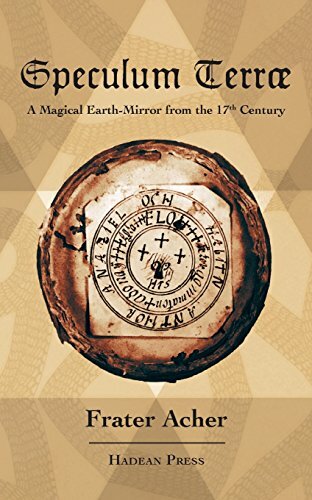 In Speculum Terræ, Frater Acher presents a detailed analysis of one of the rarest kinds of magical paraphernalia: an authentic magical earth-mirror from 17th century Germany, originally used for divinatory practices as well as folk-magical purposes such as treasure-hunting. His explorations of the background and historic ties of this curious little device turn into a fascinating treasure hunt in their own right as we rediscover the original expert interpretation of the mirror’s seal by the famous 19th century professor Richard Wünsch, and present its first complete English translation. We excavate previously overlooked magical seals contained in the mirror, retrace their divine and angelic names, are led into Italian Palazzos and to the masquerades of Swedish queens, and finally discover authentic connections to the artefacts of the early Rosicrucian movement. On a magical level this study aims to help overcome the notion that ‘celestial’ and ‘chthonic’ realms of magic exist in antithesis to each other. Rather, as we begin to see from the example of this earth-mirror, their forces can be brought together in simple practice — a folk-magical practice that is, which did not depend on exquisite materials nor complex temples, but on the practitioner’s knowledge of how to combine a handful of earth and a circle of celestial names in their very own practice.